This is Victoria, ain’t she lovely? Oi Oi! Hello there! Somehow, it’s the weekend already. And not only that, but somehow it’s almost Thanksgiving already! Where the heck has November gone??? And so, with little time to spare, I come to you waving pictures of adorable bird-friends, and asking you to extend your compassion this holiday season. Every year I participate in Farm Sanctuary’s Adopt A Turkey program, which allows donors to “sponsor” the bird of their choice. This year Waits picked our turkey, and he chose that beautiful little lady up there, Victoria. (last year we adopted Harley, and the year before that it was Rhonda) It’s not to late for you, too, to adopt your very own turkey! You can learn about why this is so very important here (that’s a happy link, no gruesomeness and nothing to guilt you, I promise). Much love! 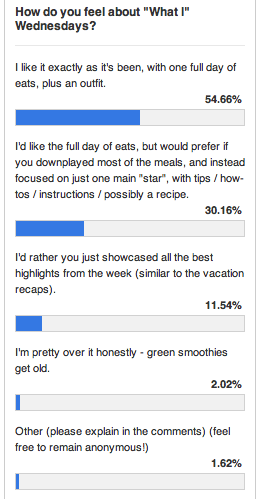 This week I took a poll to determine the fate of “What I” Wednesdays. Thank you to everybody who participated, and for all the wonderful comments and suggestions! The overwhelming majority of you like things just the way they are, which I think is just awesome. A large number were also interested in option #2, so my new goal is to structure my WIAW’s in the standard format (one whole day of food), while including as many tips/tricks as I can, plus including thoughts/reviews if I eat any packaged/premade foods, plus including a recipe whenever I can, plus including some little tidbits of personal information regarding my own feelings and philosophies on food. Sound good?! So, that is the future of WIAW. Yay! And finally, I want to give a HUGE and overdue thank you to April D and Jennifer L, both of whom were so kind to drop a little something in my tip jar. A belated but much appreciative THANK YOU, guys! It helps to keep me going and helps to make this all possible, but mostly, the gesture itself just means so much to me. More than you could know. So thank you! Bonzai Bags officially went on sale this week, and after a few minor glitches (oops! sorry!) they are off and selling! Woo-Hoo! I love this bag and personally, I’ve been using mine every day! I also think they’de make a great gift for the holidays. So, if you like what I do here and you feel like giving a little something back, well then please . 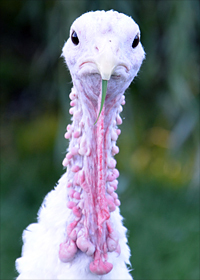 . . go adopt a turkey! Seriously, it would mean so much to me! 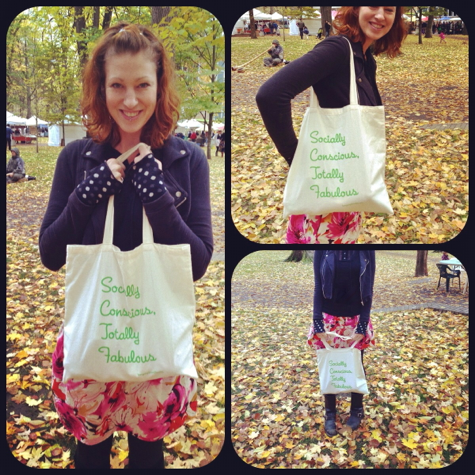 But then, if you still feel like giving, then why not pick up a swanky little organic tote for you or someone you love? Shop here!
. . . and then getting on the computer together, looking through the turkeys at Farm Sanctuary, and letting him pick out the one he wants to sponsor. This Thanksgiving, I am thankful that I found this path, and that I had the courage to step onto it, and that I get to continue to walk it every day. I am so grateful to be vegan, and I am so grateful to continue my own journey towards a mindful and nonviolent existence. I continue to struggle (temper, anxiety) and I continue to strive (patience, perspective), but the fact that I’m walking at all is what really matters. Watching my son delight in the animals, and thinking about these sweet turkeys who will get to live, and snuggling into my doggie pile on the couch with my boydogs each night – these are the things that inspire my journey. And I am eternally grateful. Oh glory! On Sunday we fly away home, to southern California. I’ll be gone for almost 2 weeks! I’m so excited to see my family and friends (and for them to see Waits), and I’m so looking forward to warmer weather and a good dose of sunshine, and playing on the beach with my baby, and relaxing, omg, relaaaaaxing. Also! Looking through old pictures of Waits (where did my baby go?!?) // reintroducing gluten and Waits not reacting, HALLELUJAH, no more gluten-free-by-necessity! 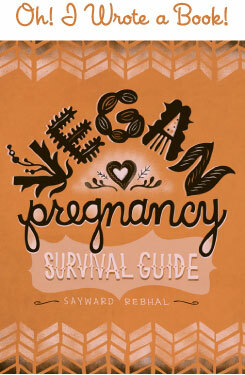 // following in that vein, Sweetpea’s all-you-can-eat vegan brunch and the best damn biscuits and gravy I’ve ever had the pleasure of nomming on // Getting a great and glowing book review for The Vegan Pregnancy Survival Guide // my husband and my baby, feeling especially in love with those two today . . . Happy weekend, my dears, and happy upcoming holidays to you! That sounds like an awesome documentary, I’ll be on the look out for it. Thanks! Thanks for the link to that CD – I’m definitely going to check it out. And I’ve been enjoying your book meme as well. Alas, it reminds me how woefully under-read I am . . .
That IS a perfect celebration. And CONGRATS! 6 months is a huge accomplishment – you should be proud! That is so awesome, I love hearing from veg-from-birth folks – especially when they are ridiculously awesome/beautiful/smart, too! Aw, meet Antoinette. I didn’t even know you guys did this until just now. :) I was adopting this girl right around the same time. Love this!